Wow what a winter we had in Central Oregon! At one point 28 inches of snow on the ground for multiple weeks. Turns out we didn’t have deer prints in the snow but belly prints from the dear drudging through the snow. 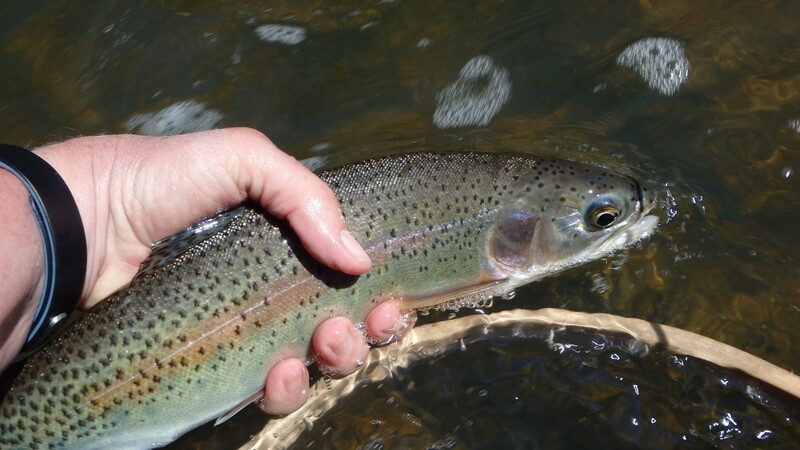 Spring is late to come and waters are high – but this last week I have been able to get out multiple days on multiple pieces of water . It was been splendid to be on the water. Water has been high on the Lower D, one day 6200 CFS but dropping, yesterday it was 5300 CFS. 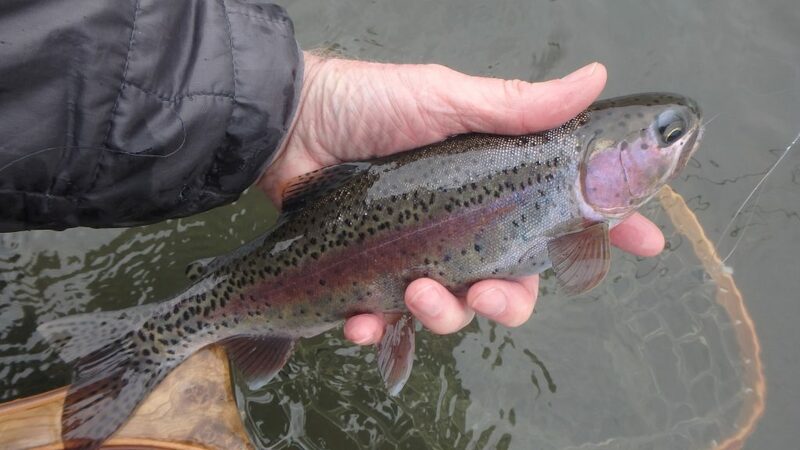 Both days we have good fish action -No big Deschutes Redsides – but some nice fish in the 12 to 14 inch. 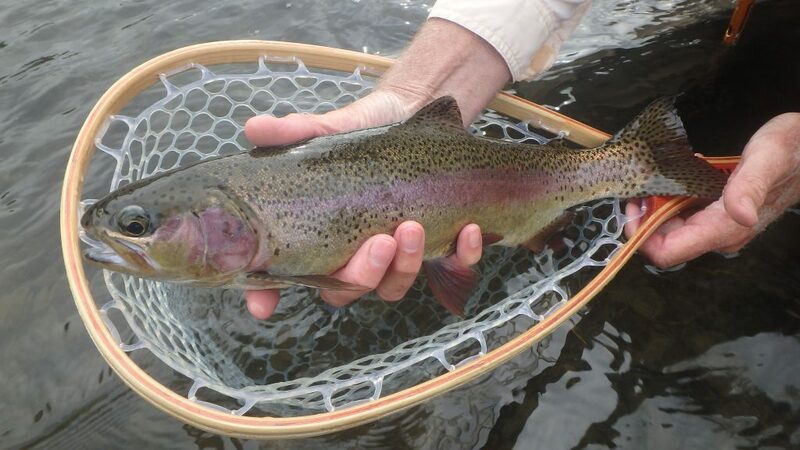 Amazingly nothing on the big stone fly patterns. For me everything was on a green rockworm pattern and Dave a Cadis Pupa. Love my Winston Super 10 so sensitive to the subtle takes. My most productive fly – a Green Rock Worm. Yes that is my tie! 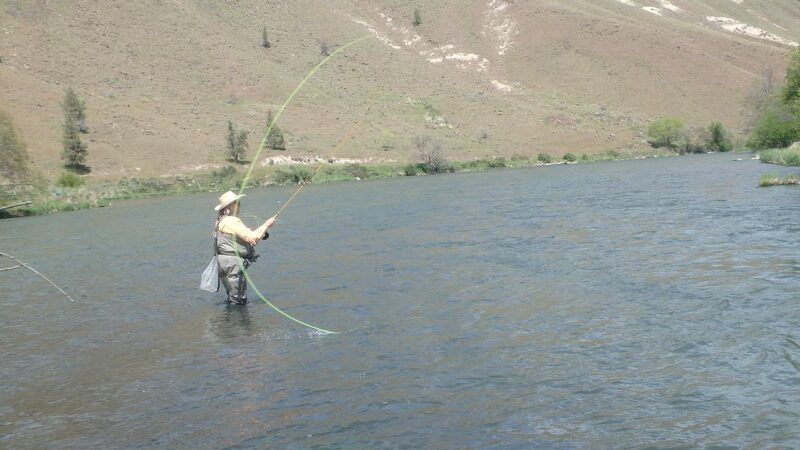 Checking out the loops on my 8 foot 6wt rod. Loved how it cast the big dry stone flies. However the fish weren’t interested. It’s been a while since I swung flies with my 10’5″ 300 grain micro spey. So fun – a few grabs but I was snoozing. 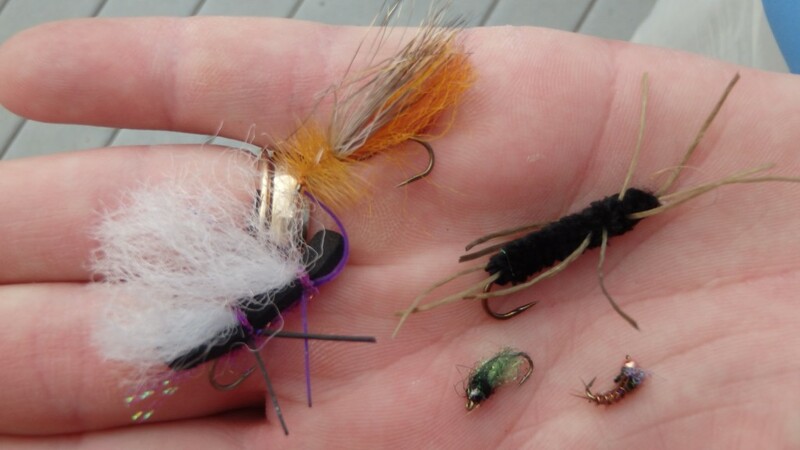 When I first started fly fishing I never gave enough credence to the importance of bugs. Now, I think you can’t know too much about bugs. 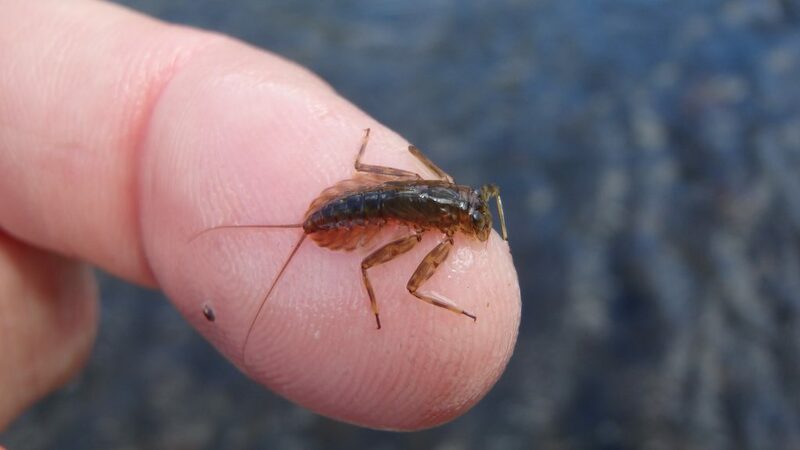 I’m a firm believer that it’s a good idea to “check out the bugs” in the river nearly every time you fish, especially if you’re doing a lot of nymph fishing. 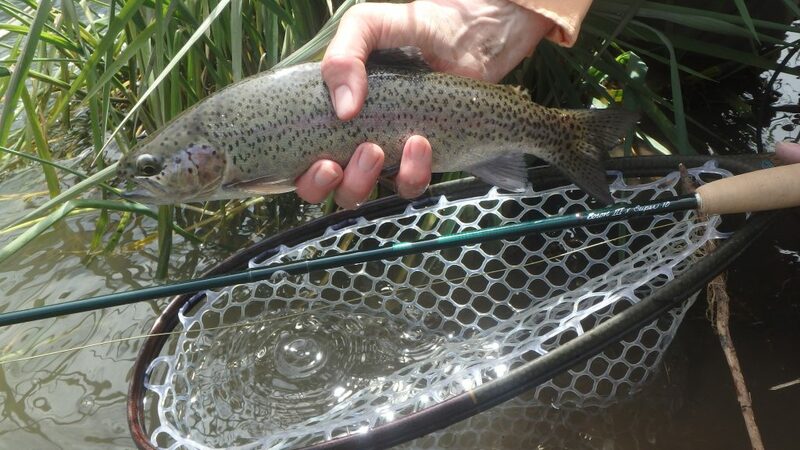 Dave and I were on the Crooked River last week fishing a spot we fish often and started with a bug sampling. 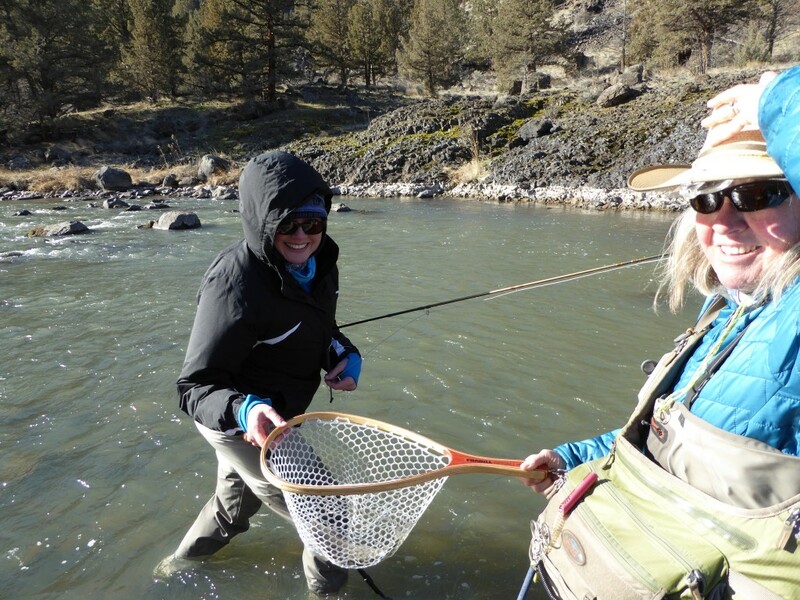 We have a small net that is about 15″ x 15″ that one of us holds in the water while the other turns over rocks upstream. We then transfer the bugs in the net to a white bowl that aids in viewing and identifying. 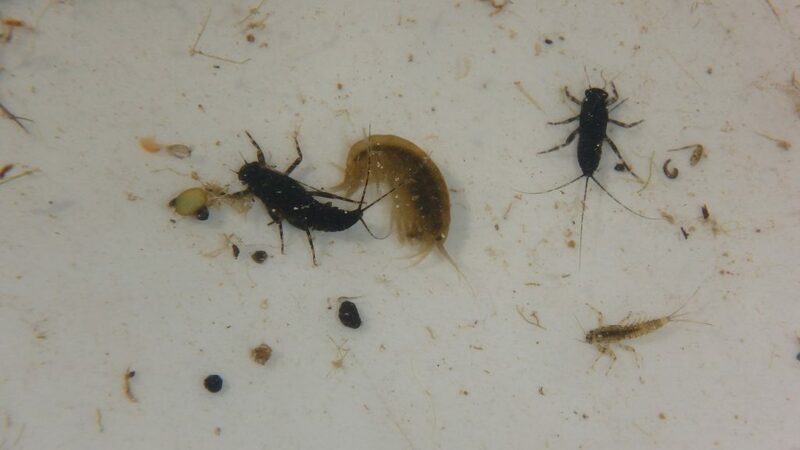 For the particular spot we sampled, there were very nigh numbers of olive/tan scuds in sizes ranging from about #18 to #10, as well as black mayfly nymphs that were about #18 and #16 in size. We both used euro-nymphing techniques for our fishing for the day. 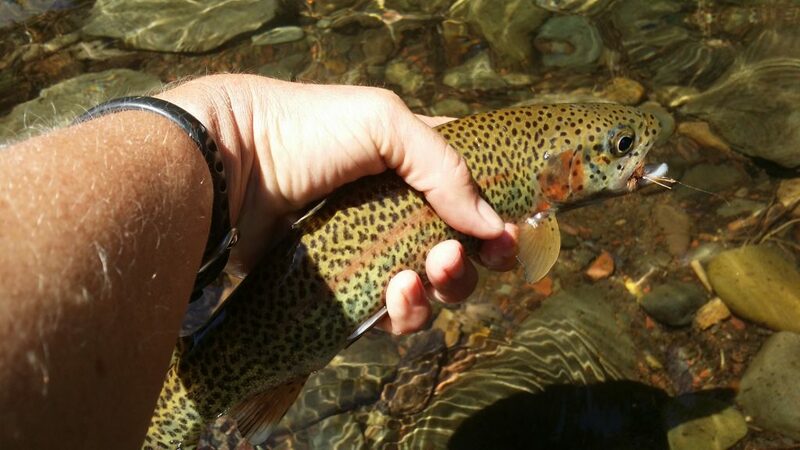 Using #14 and #16 gold or tan scuds, #18 Psycho Mayfly nymphs, and #16 Black Beauties produced a lot of rainbows in the 6″ to 14″ range. So, knowing the bugs in the water and matching those bugs certainly helped us. Here are a few photos of the day. 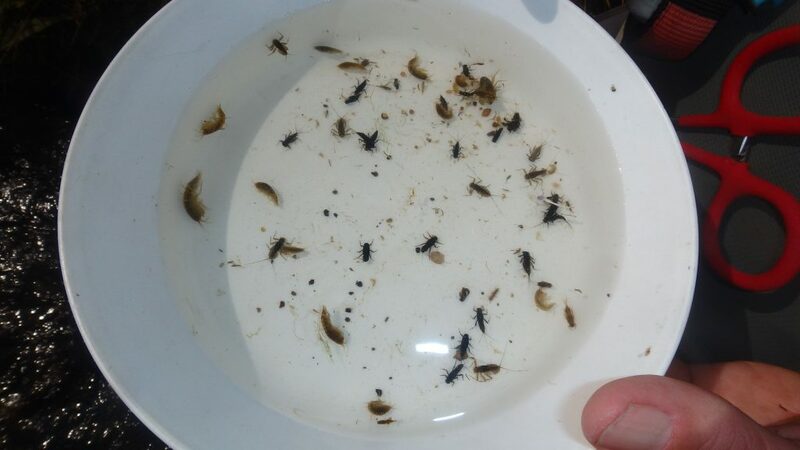 Look at the diversity in bugs on the Crooked River. 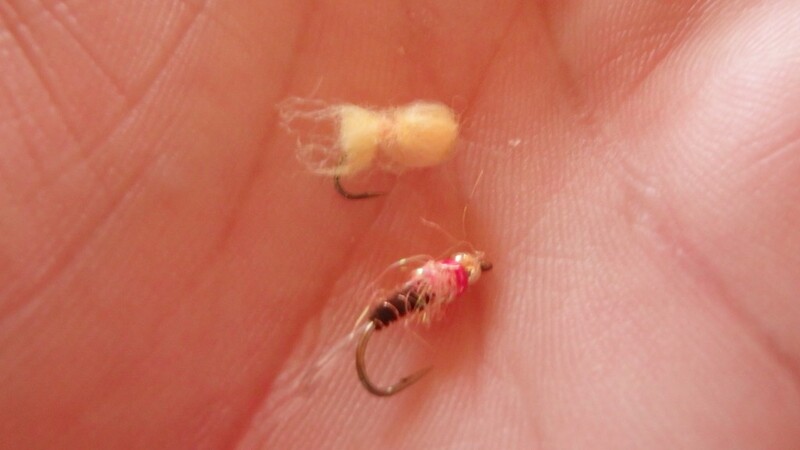 A closer look at the PMD (Black) Mayflies, a scud, and then a small BOW. 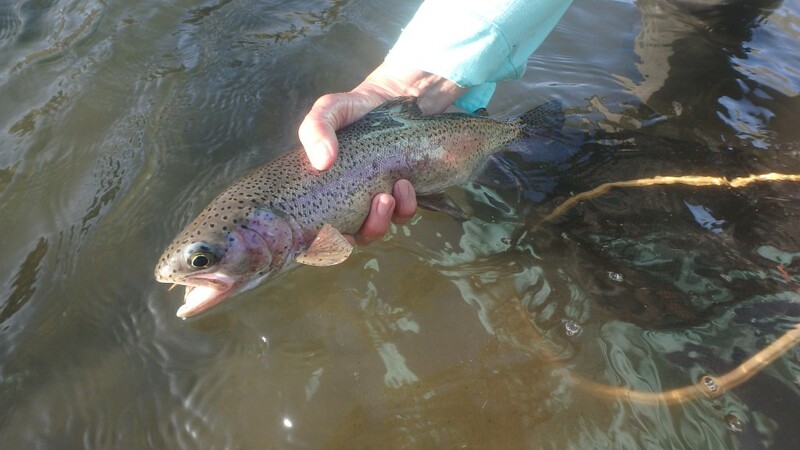 A nice 14 inch rainbow – I was able to convince my fly was the real bug! A great way to end a great day! The summer’s always get busy for me. So I relish a day where Dave and I can enjoy the water together. Yes we call it our equivalent of a date night. 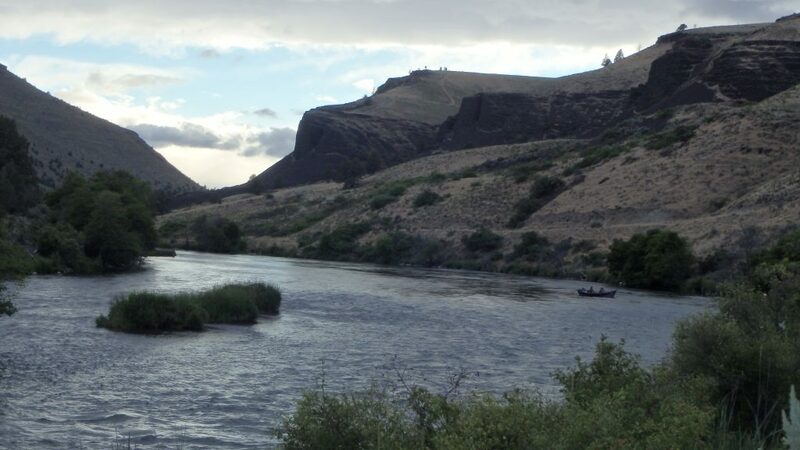 This Friday we had our date on the Deschutes and the Deschutes showed us her better side. 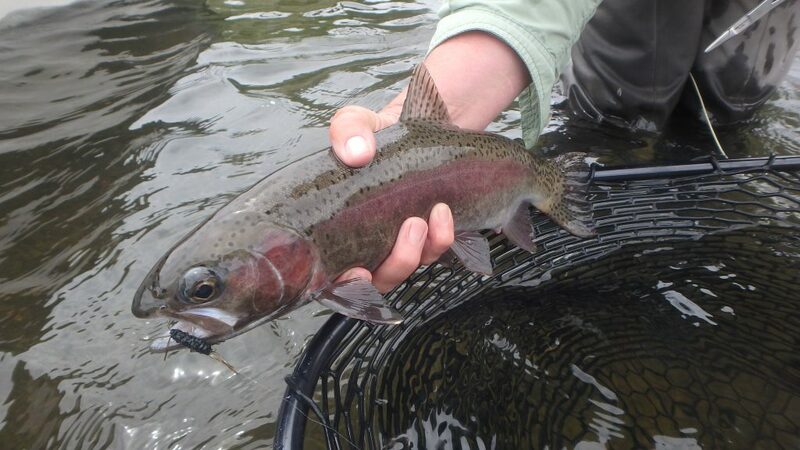 Or should I say the Deschutes Rainbows showed us some of her better red sides. 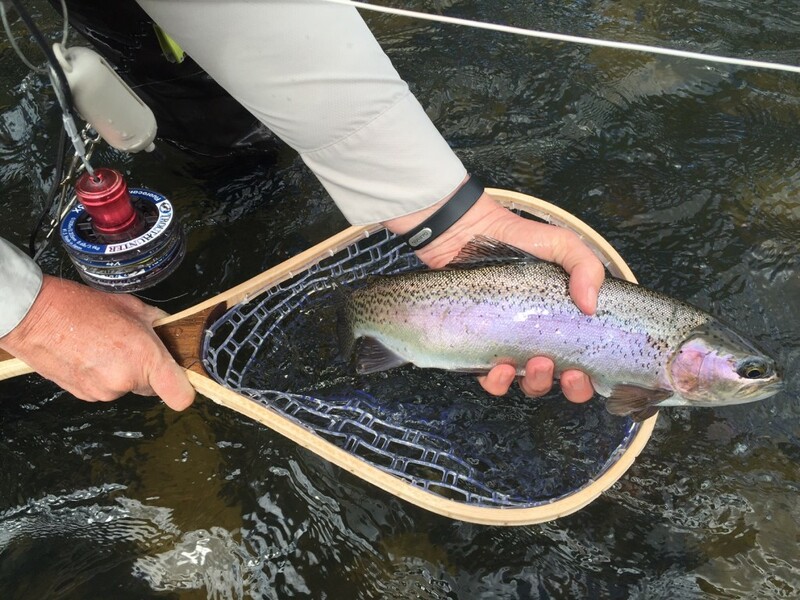 Always a great Day on the Deschutes River – but extra nice when we can bring a good number of rainbows to the net. 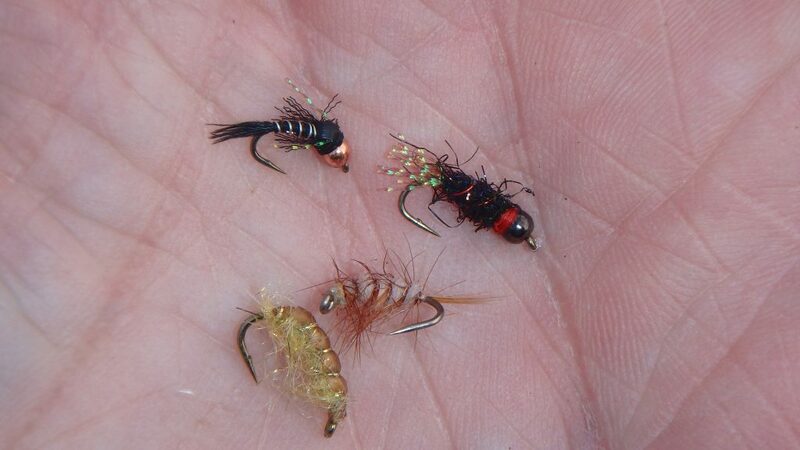 The flies that worked the classic black rubber legs, sparkle caddis pupas, and a BWO nymph! Enjoy the photos. Took time to collect some bugs – is this an albino stonefly? Wow – early June and temperatures in the mid-90’s. 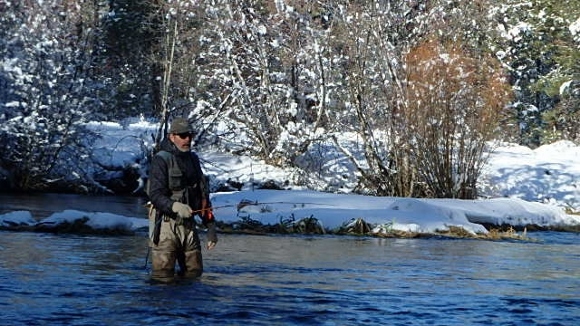 Where to fish – someplace where waders aren’t required. 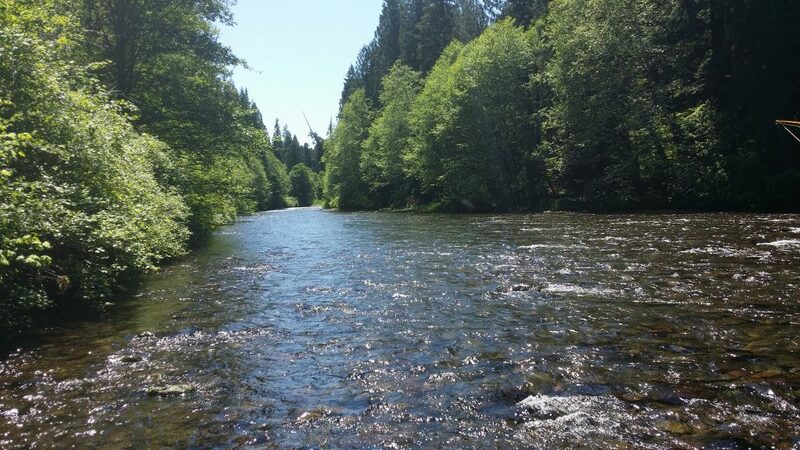 The North Santiam River was my destination on Sunday! 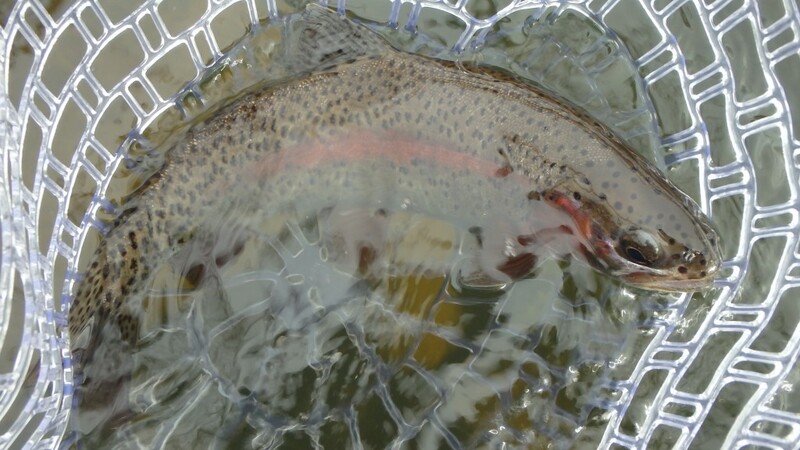 The balance between the cold water and warm air temperature – kept my comfortable when I was fishing. 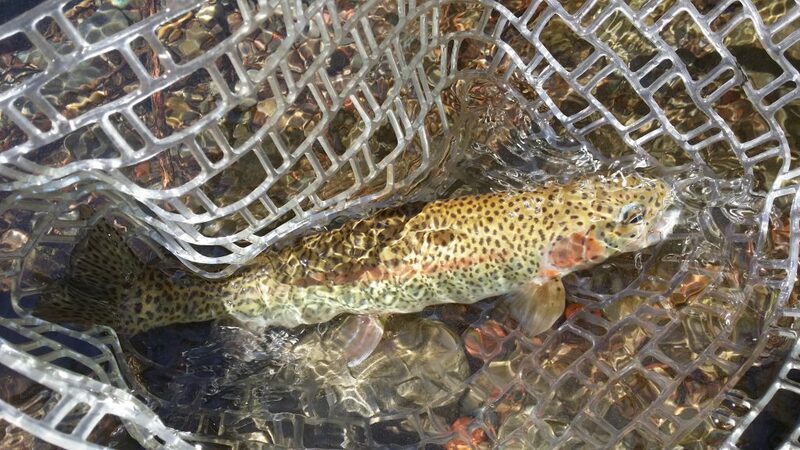 More importantly – what a fun small stream to fish. Perfect for a small weight rod and dry flies. I caught a good number of fish int he 8 to 12 inch range – but on my 7 foot 4 wt bamboo was a perfect match. Even a 8 inch fish bends the rod deeply. 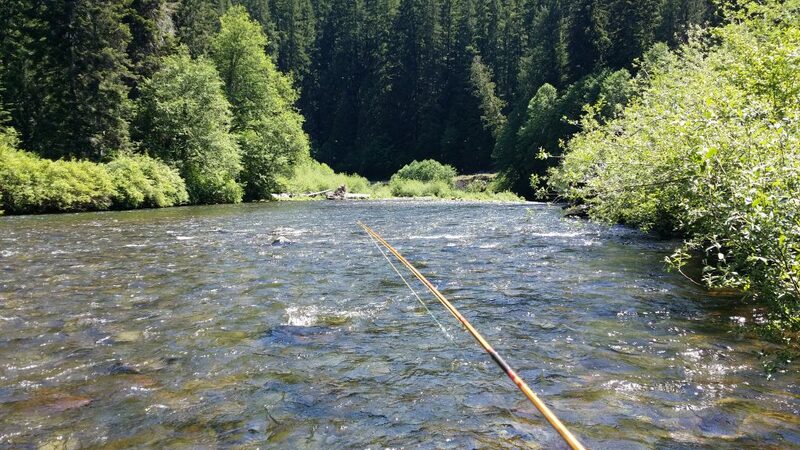 The North Santiam River is situated on the east slope of the Cascades. 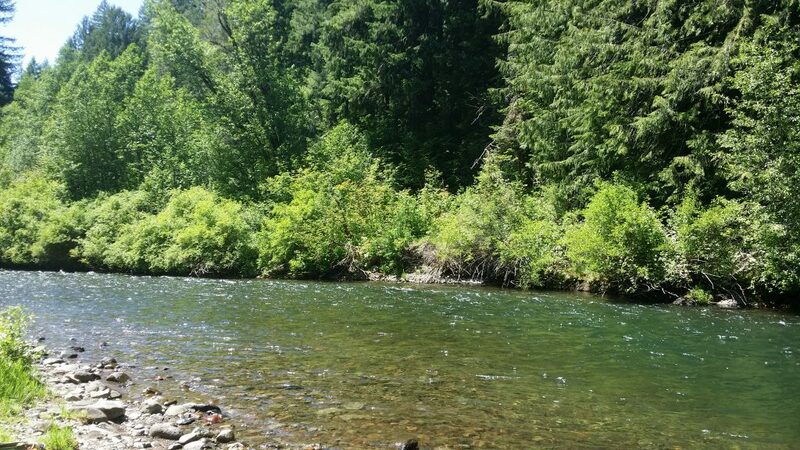 As you can see from the photos it is a heavily forested area with splendid water with riffles, runs, and pools all holding fish. Little fishing pressure makes this a great 1/2 to 3/4 day destination. 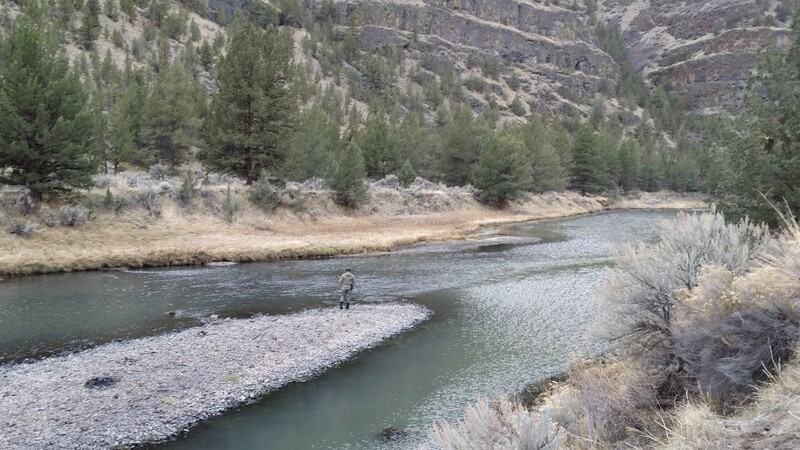 Classic view of the numerous riffles, runs & pools to fish. Plenty of structure for fish everywhere. Keeping one of the many fish wet! 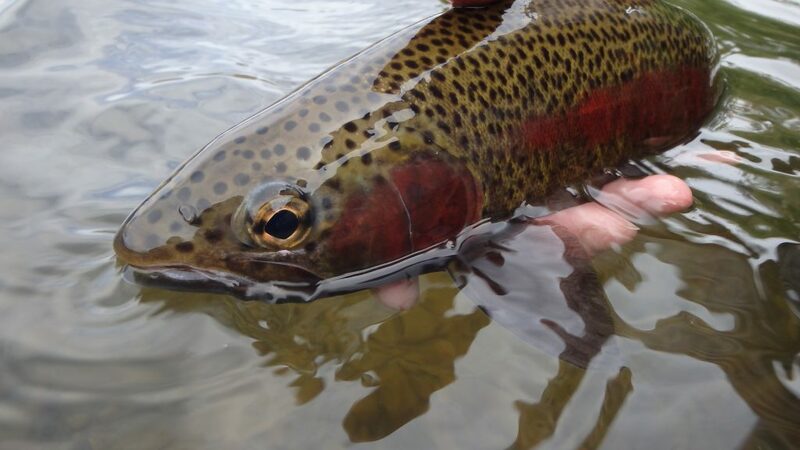 Just a quick out of the water shot to show off the beautiful colors of the rainbow. Check out the dots, the red band, & red cheek. Wow – my last post was at the April 28. My goal is to post weekly! Today is May 29th! What happened to May. 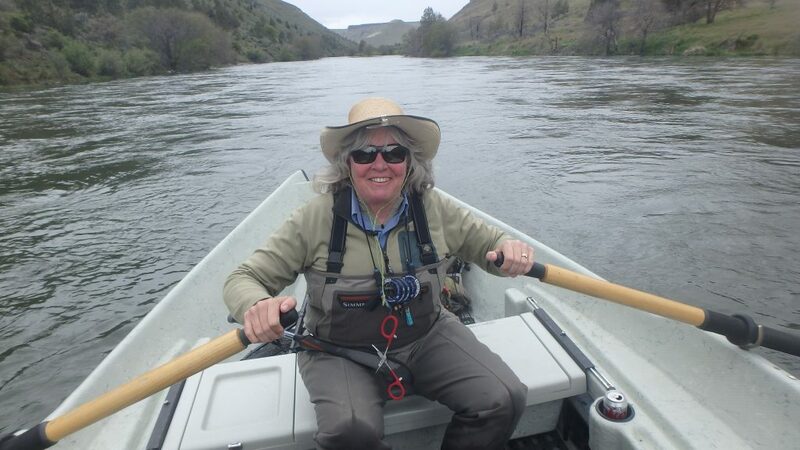 I know what happened to May – I was busy scouting waters, teaching fly fishing classes , a few private casting lessons, and yes a good number of days guiding! I feel as I have been behind the 8 ball all month. A few days at home this week – and my to do list is getting reasonable. Key word reasonable – not necessarily done. But you don’t want to read about my scrambling to get my to do you done – you want to read about my fishing. I will start with a great evening Dave and I had with the Wild Women of the Water. They came over for an overview of building bamboo rods and socializing, of course. 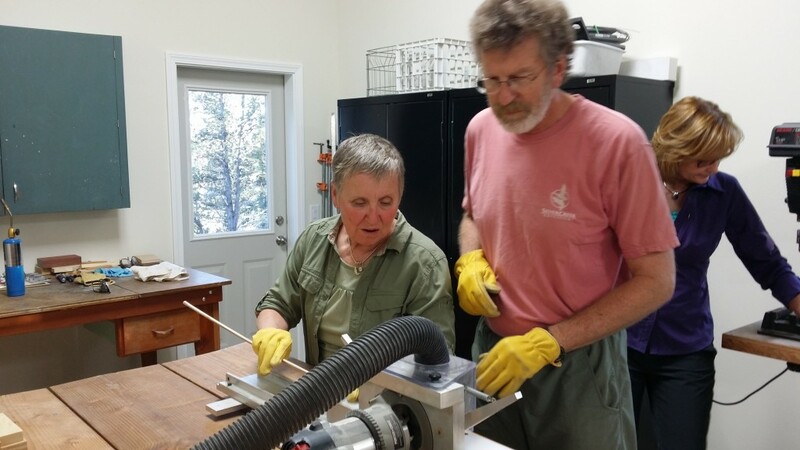 You can check out Dave’s Blog to see all the photos – but Kari running a strip through the beveler is my favorite. Now back to fishing! 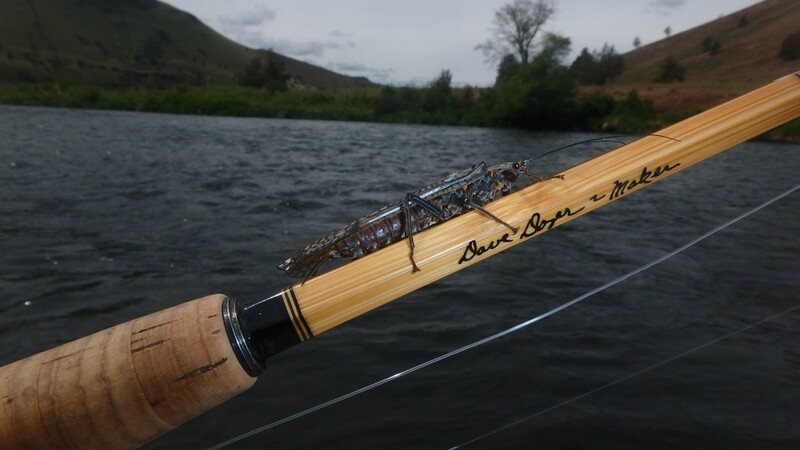 I have spent a majority of my time on the Deschutes River – plenty of stone flies out and about! 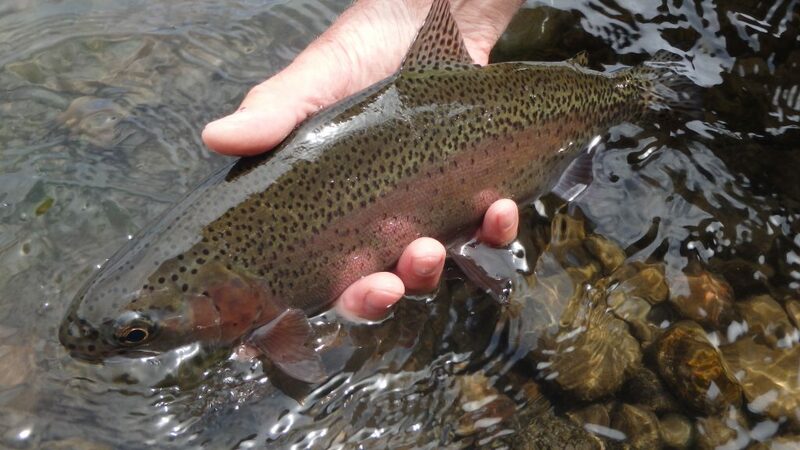 Love the aggressive takes of the big rainbows as they take them. Amazing experience – if you get a chance in the next week get on the water. The hatch will be winding down in a few weeks. A few photos of the fish, flies, and amazing shots of the real bugs. 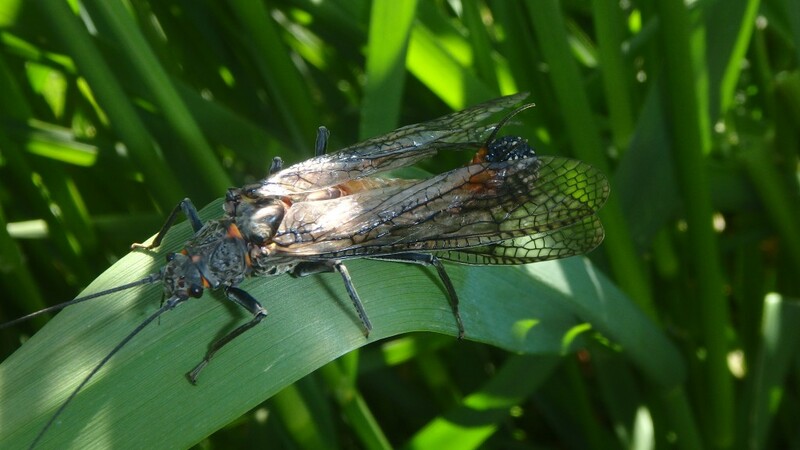 Salmon Flies love grass! So of course they gravitate to bamboo! 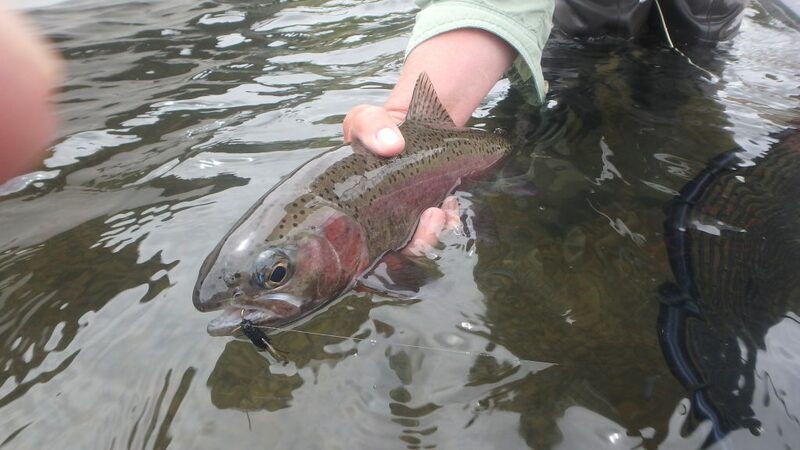 The best part of the Salmon Fly Hatch – aggressive takes! 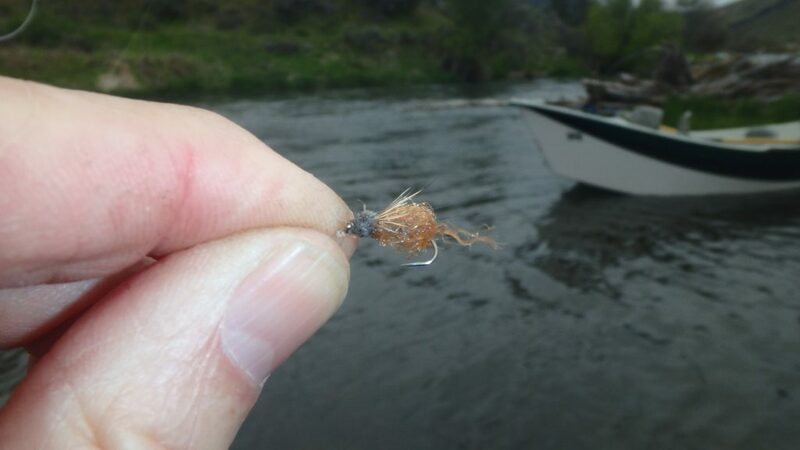 I have also been on the Crooked River imitating the Mother Day’s Caddis hatch with success! 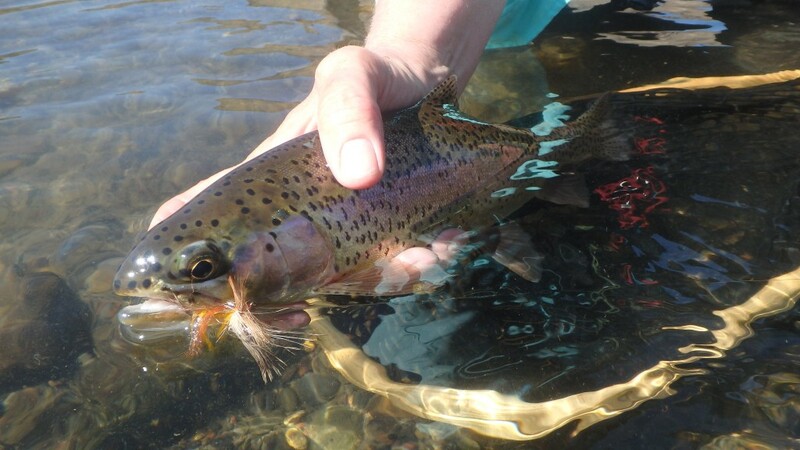 This rainbow was fooled by my tattered fly – A fly I have been successful with on lots of waters. Last week I took advantage of some great weather , I placed a priority on fishing and got on the water 3 days in a row. It felt splendid to be on the water! Life has been too busy! Like any day fishing each day takes a life on it’s own. 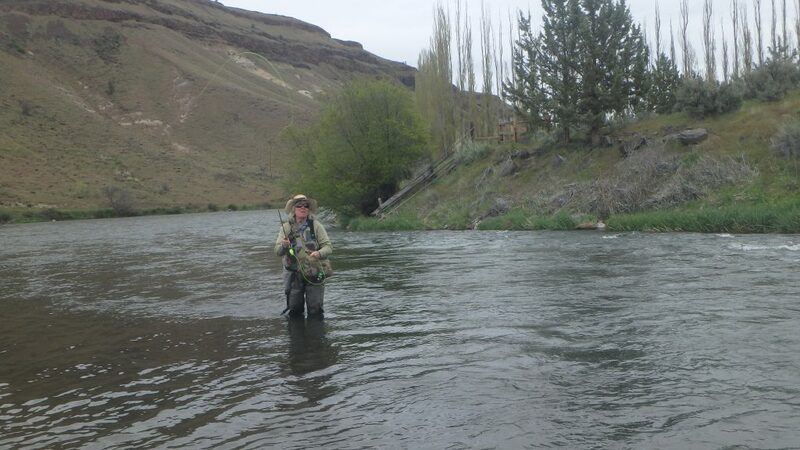 Friday on the Deschutes was a bit overcast – and minimal wind. 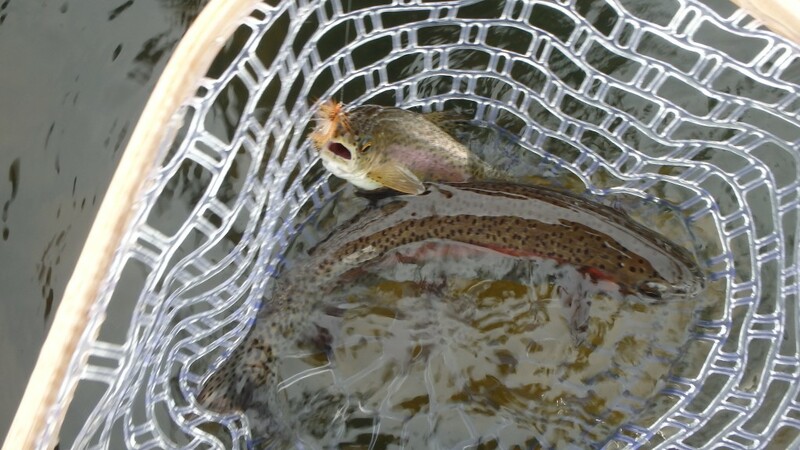 Saturday was a new day – sunny and windy on the Deschutes. Sunday – a new river was called for, so I headed to the Crooked. I got two weather days in one; before noon it was a light drizzle and then after noon the sun came out. Each day brought a few fish to the net. 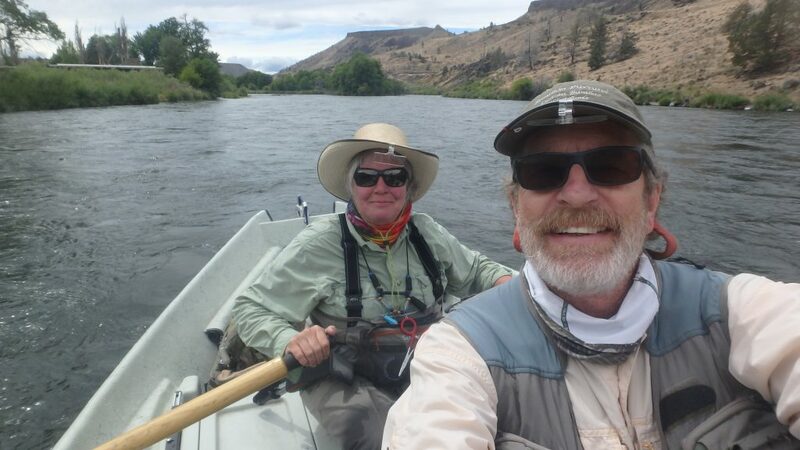 On the Deschutes – it a lot of small steelhead & salmon smolt and a good handful of classic Deschutes Redsides. 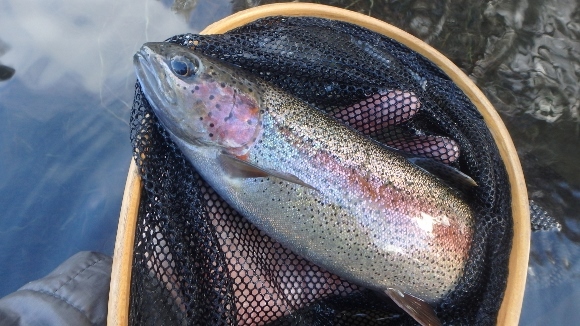 I was rewarded with a couple of very nice rainbow for my couple of hours on the Crooked. 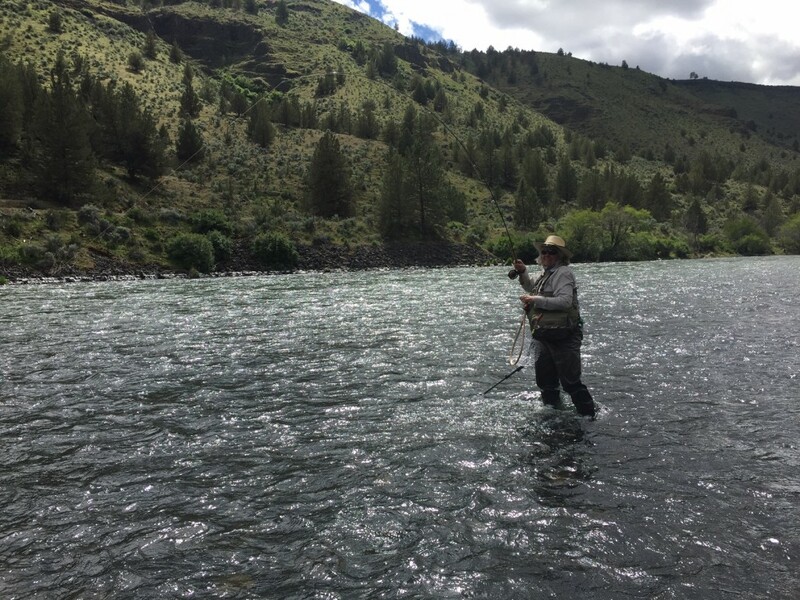 Deschutes River – Redside on! So you may ask what do Dave and Mary Ann Dozer do on a Saturday night in the winter? Tie Flies, of course, is our response! 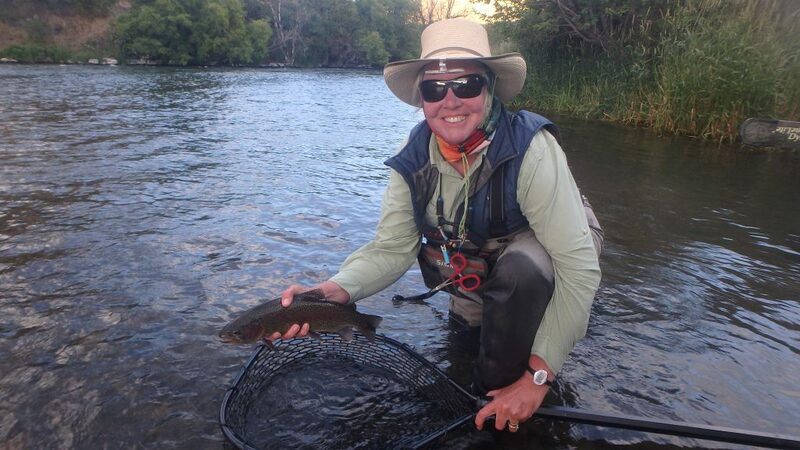 Yes – a new version of romance for the avid fly fishing couple. This evening our focus is stone flies – dry and nymph. I tied the Clark’s Lady Stone Fly and Dave tied a Tungsten Yellow Sally Nymph. 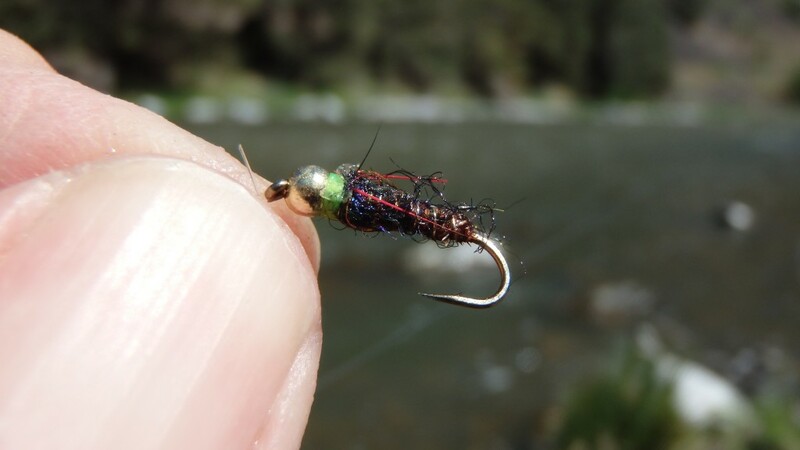 We look forward to testing out the Clark’s Yellow Stone Fly on the Deschutes River this Salmon Fly Season. 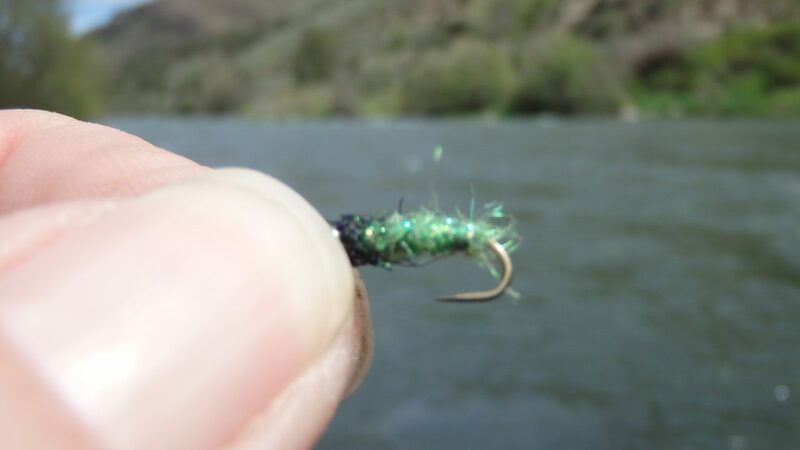 The tungsten yellow sally has worked for us in all season and all rivers in Oregon and Idaho. Our waters and weather have been cold this winter. 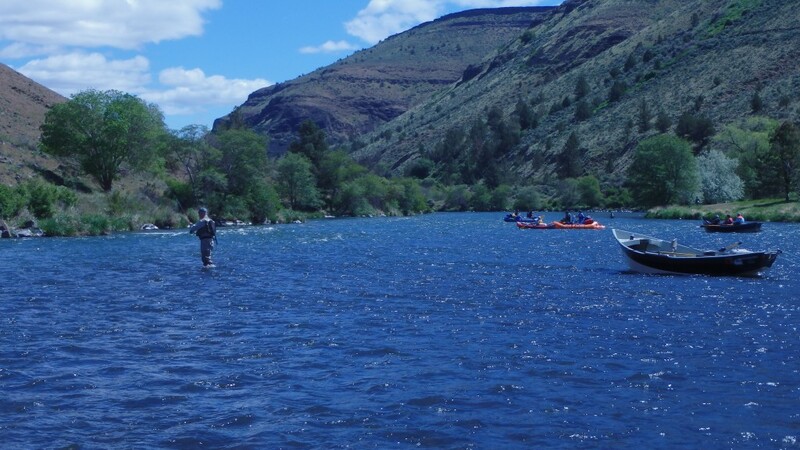 However, last week the weather warmed up a little, which I hope would warm the waters on the Crooked River. I measured the temperature at 37 degrees. Still pretty cold for the fish. The good news was they increased the CFS to 56. This is still much lower than the average winter flows. 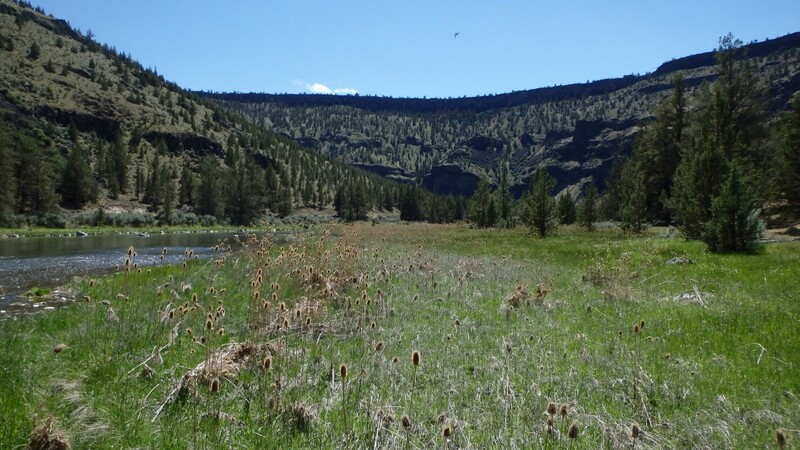 On Sunday – I headed to the Crooked River by myself. 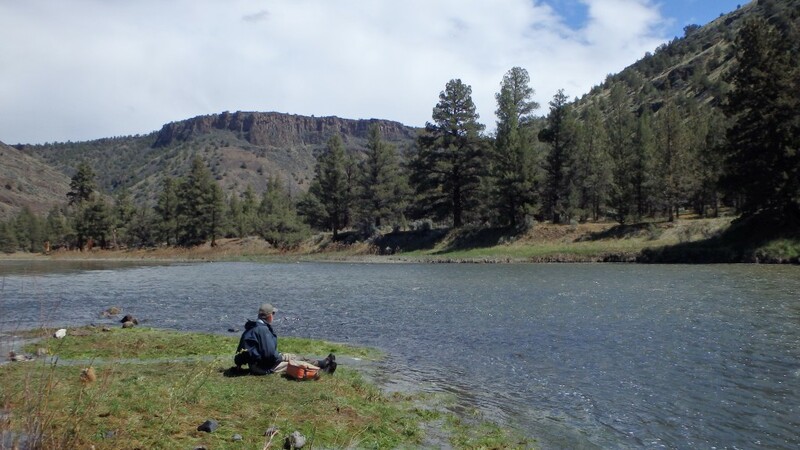 I enjoy fishing with others, but I forgot how renewing it can be to be alone on the river. I wouldn’t want to always fish alone – but good to make it a point occasionally. It was one of those days where I picked the right spot and right flies. In the first hour Euro-nymphing – I landed six and lost four white fish. No complaints on my part! I was using a #16 egg pattern and a #18 Brian Egan Frenchie. I headed out on Wednesday with some friends. My goal was to introduce them to Euro-nymphing. They quickly caught on – even with the pesky wind that doesn’t help when Euro-Nymphing. 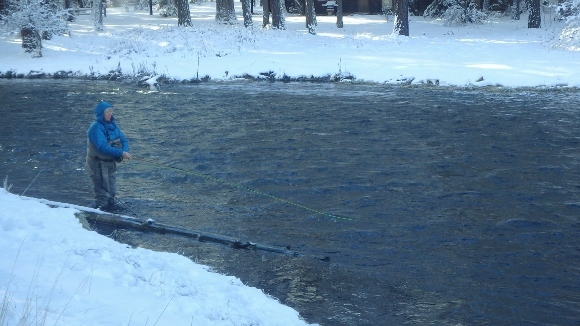 Fishing the Metolius on Christmas Day! What Fun!!! 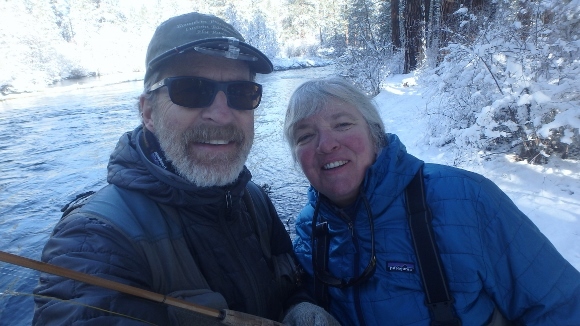 !Christmas day….27 degrees….beautiful sunny day….8 inches of snow….and Dave and I went fly fishing on the Metolius River. 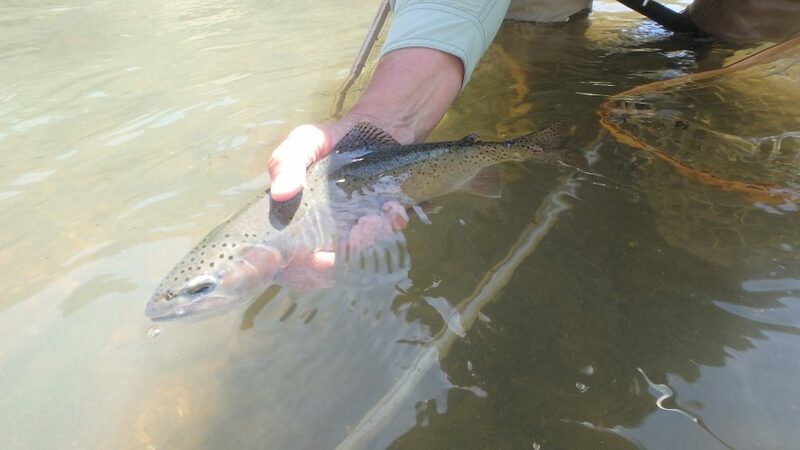 I used my 10′ 6″ 5 wt bamboo switch rod to swing streamers, and Dave used his 8′ 3″ 5 wt bamboo rod to Euronymph small nymphs. 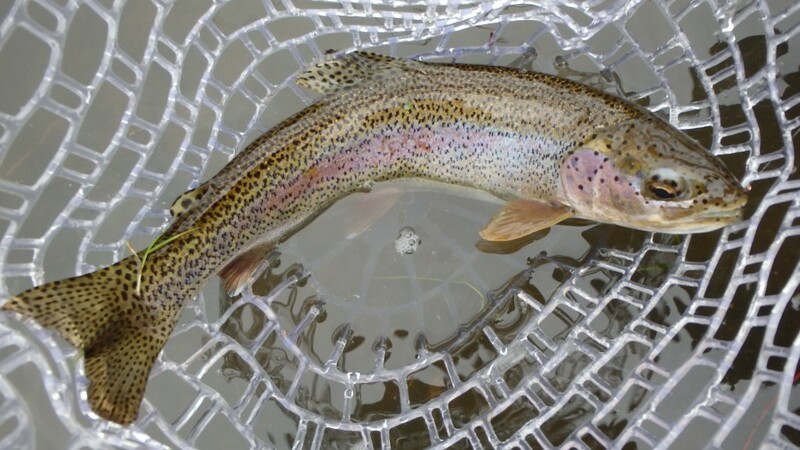 We tempted a few trout to our flies, and got one nice rainbow to the net. Here are a few photos. Waiting for the elusive tug! Winter Fishing on the Crooked 12-11-15. But back to the Crooked River. 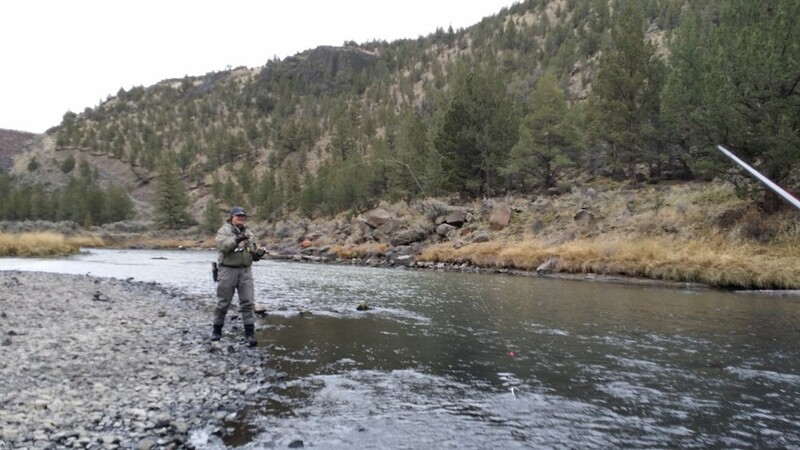 My last fishing pursuit was to the Crooked River on December 11th! Water levels are running really low – down to 36CFS. However, the white fish can still spawn. It too a few stops but my friend and I found some spawning white fish. And when you find them you will find rainbows. We had a flurry of doubles in the 30 minutes I was there. She stayed and caught some more. 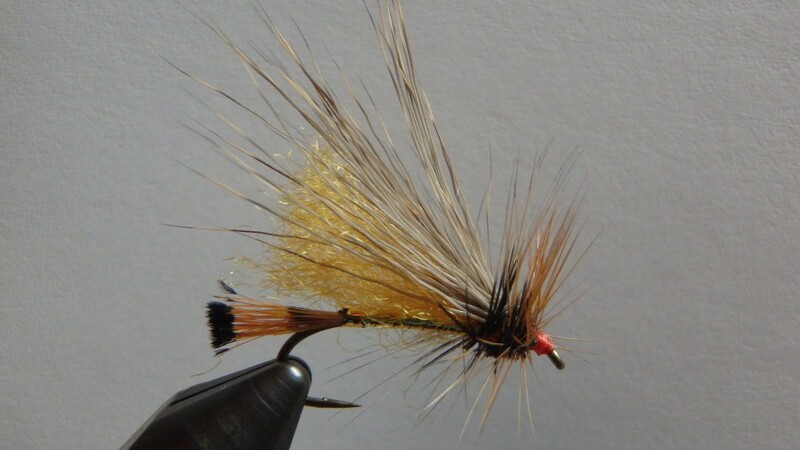 In addition to egg patterns – a orange Ray Charles was also the fly of choice. You will always find rainbow when you find spawning white fish. My buddy and I with a double – tough to get a good photo when you have a fish on!